Grilled cheese with hummus, shredded carrots & radishes, pickled turnips and lettuce. 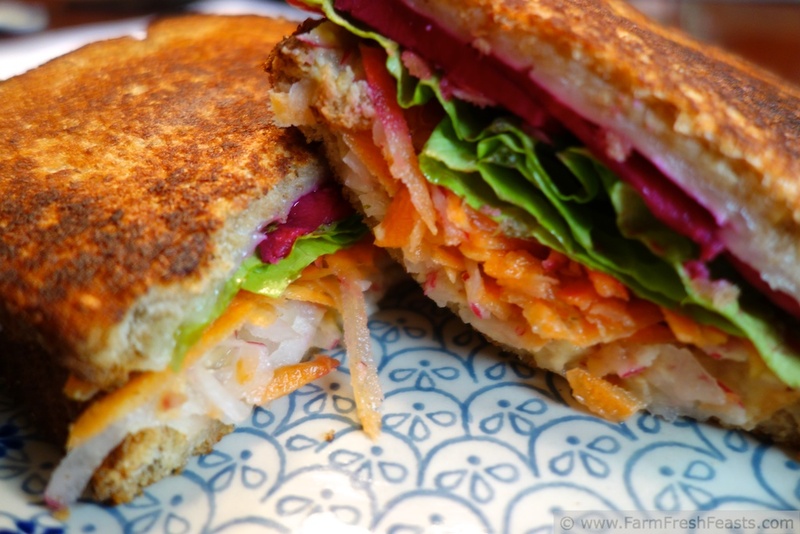 When I shared a photo of a grilled cheese sandwich as the centerpiece of a lunch collage in this post on how to eat more veggies, I felt like I was teasing you. So I'm sharing a bit more about my favorite grilled cheese sandwich to inspire you, and hopefully make you hungry. I know I'm getting peckish. Long on photos, short on words because honestly, this is just a simple grilled cheese sandwich. If you're ever in the Cincinnati area and hungry, I recommend paying a visit to a Tom+Chee restaurant. They've got amazing grilled cheese sandwiches and delicious tomato soup. My friend Holly told me about it, and whenever we can we swing by for a meal. My favorite sandwich is the Hippy Chee. It's got hummus, cucumber, tomato, and lettuce with your basic grilled cheese. Tom+Chee manages to keep the bread toasty and warm, the cheese melty and hot, and the veggies cold and crisp. It's addictive. I'm still figuring out their technique--it involves a long spatula to fry both slices at the same time before lifting them off the heat, adding cold veggies, and mashing together--and I've found a way to incorporate my farm share veggies which delights me with the results. Try it yourself! You need a good bread. I like a wide pan bread by my local grocery store, but the farmhouse loaf from Pepperidge farm works well too. Top the bread with a thick layer of hummus. You need good cheese--extra sharp cheddar for our family. 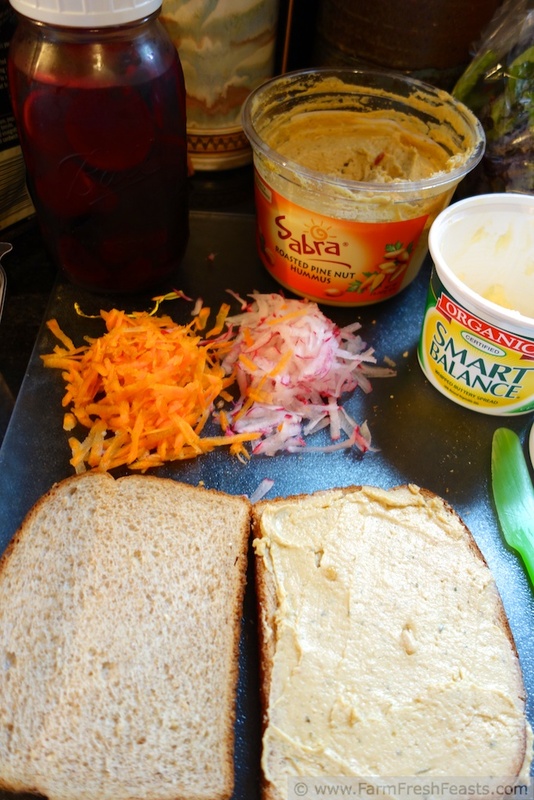 You need other veggies: shredded carrots, shredded radishes, and, if you have them, pickled turnips. You may not have the pickled turnips--I got the idea to throw a scrubbed, sliced raw turnip into a jar of (leftover) pickled beet pickling liquid because I love Lebanese food, and the pink sticks alongside my Chicken Shawarma are pickled turnips. Not sure how really to make them, but using up all the pickled beets, tossing a turnip into the jar and putting it back in the fridge for another week or two works for me. These keep for months in the fridge! You need a bit of lettuce. I've got a great CSA farm share that provides me with a tasty salad mix much of the growing season, and I cannot wait until the farm share resumes *next* month! Woot! And you need a fat to coat the bread. I use Smart Balance Organic Buttery Spread. It's vegan, not that it is important for my household, but with the right bread and cheese, this would also be a vegan meal. Preheat a small skillet over medium heat while you spread the hummus over the bread. Add the cheese, the shredded vegetables (about 1/4 cup each) and layer of pickled turnips. Top with the other slice of bread. 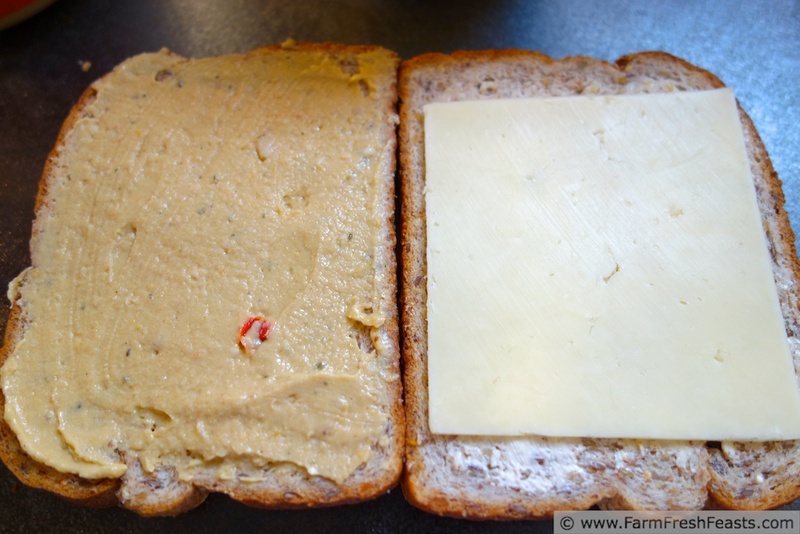 Spread the fat of your choice on the top of the sandwich, and put it fat side down into the hot skillet. Spread the new top of the sandwich with fat. Flip it over when it's nicely brown and cook until the bottom slice is browned. Remove to a plate and, unless you know Tom+Chee's magic trick of the open faced grill and long spatula, quickly lift the bread lid with one hand while shoving lettuce onto the sandwich with the other hand. Enjoy! What's your favorite grilled cheese sandwich? Here are some other yummy-looking ones: a Spiced-Up Grilled Cheese from from Gourmet Veggie Mama, a Caramelized Onion Grilled Cheese from $5 Dinners, and a fun Grilled Cheese Pull-Apart snack from Putney Farm. This post is linked up with What's Cookin' Wednesday at Buns In My Oven, the Wednesday Fresh Foods Link Up at Gastronomical Sovereignty, What's In The Box at In Her Chucks, Taste and Tell Thursdays, Strange but Good at Sprint2TheTable, the Farm Girl Blog Fest at Let This Mind Be In You, and the Clever Chicks Blog Hop at The Chicken Chick, and Food on Fridays (twice). I love pickled turnips!! We eat them all the time with Syrian food. I love that you eat them! How do you make them? I never thought to ask at the Lebanese butcher in Northern VA where I first found them. I just know that they were pink, so clearly there was something other than plain pickling going on. Mine are good, don't get me wrong, and if I can't figure out the REAL way to pickle turnips I'll keep on doing this my way, but I'd love to have a proper recipe. Snort! Like pickling is more science than art, and like there can be only one proper way. pickled beets are the best!! I think I'd like pickled turnips :) I'm all for putting extra veggies in anything. I love pickled beets too! I'm the only one in my family who does, so I get each batch all to myself. My mom was recently here and fixed a meaty-livery twist on a Danish dish that is traditionally served with pickled beets, and I ate nearly half a jar with that. Yum! The pickled turnips are a great addition! Yep, I like both the color and the taste they add. 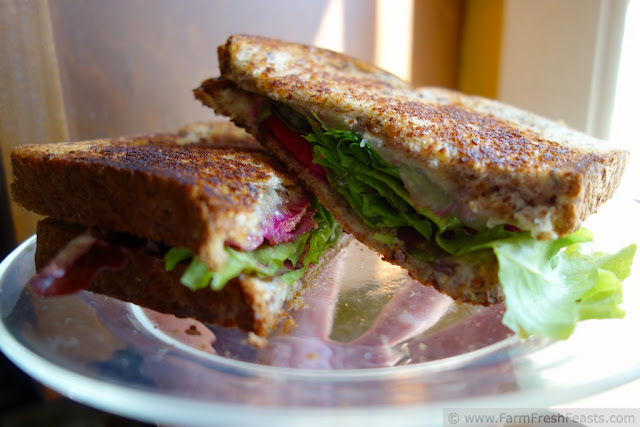 I could eat this sandwich any time, and I cannot wait for my CSA to start up so I'm getting more radishes. I've been pleasantly surprised how long my pickles are holding up. I did a massive jar (really, a very tall canning jar, I don't know what size but bigger than a quart) at the tail end of the cucumber season and it's still crisp and tasty. If you've got extra pickles, Juanita's Cocina has a great pickled dish (I did mine with ground pork, but I think hers was a pork roast) that is a gret way to use up pickles. In my case it was a pickling failure--yellow squash--that tasted fine but no one else would eat. Using the pickles in that entree made a delicious meal. That is a grilled cheese sandwich on steroids. I love it! Thanks for linking up to What's Cookin' Wednesday! It's a true example of the power of veggies. What a marketing campaign: Veggies, the New Steroids. Good thing I'm not an ad person. I love anything pickled in my sandwiches, but have never tried pickled turnips. I have a feeling that if I made this sandwich once, I would never want to go back to any other grilled cheese sandwich. I am sad to say it's true. Once you've got pickled turnips . . . well, you know the rest. Luckily it's pretty easy, during the CSA season at least, to have all the ingredients on hand. Thanks for your suggestions! I will check them out. 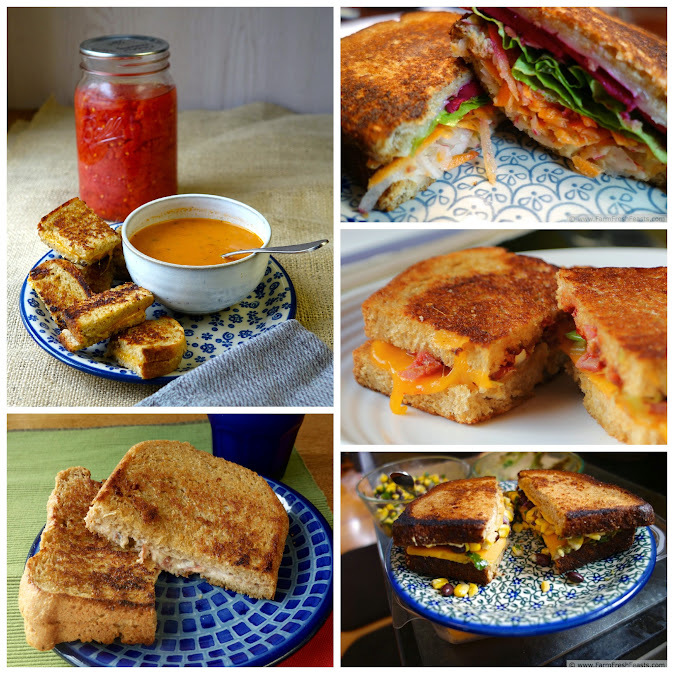 It's funny--just like I'd scheduled this post without knowing April was National Grilled Cheese month, the recipe I'd scheduled for April 8th already included some references to the food bank where I volunteer. I needed to tweak it, of course, but the bare bones were already there. Wow I love this sandwich and now I am hungry. Be back later later I make a sandwich. I hope you enjoyed your sandwich! I did a grilled cheese post awhile back. But mine was old school – no veggies. :) I do like to add thinly sliced apple sometimes, with Brie and sharp cheddar. Or bacon. Hmmm, I'm moving in a decidedly less healthy direction! Now I want a grilled cheese! That sounds so tasty to me. I've never combined brie and sharp cheddar but I bet the combo is amazing. I'm trying to create a 'cheese plate pizza' and now I know I can overlay those two cheeses with success--thanks! 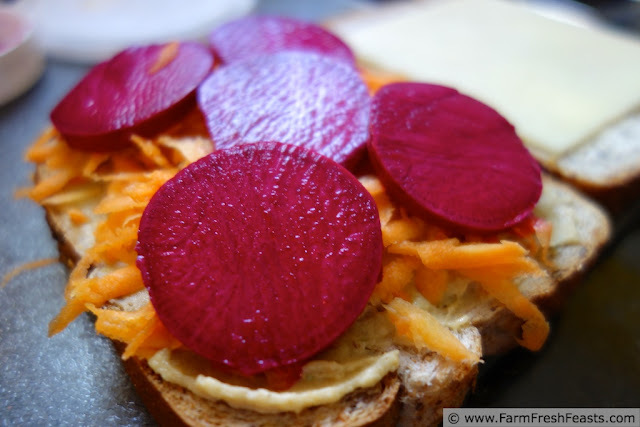 That's a beautiful sandwich, and I would never have thought of pickled turnips or beets in a grilled cheese! Of course, I must try it. I like making sandwiches for lunch because then I can take a picture with good lighting and have a better chance of it looking ok.
All the pretty colors make me happy to eat it. Please let me know how you like it. Looks great! I love the idea of veggies on a grilled cheese. My kids aren't crazy about the idea of veggies on a grilled cheese, but this is one instance where it's very easy to make a variety of different sandwiches without a big production. And I hate big productions. I think my heart just stopped at the sight of that perfect looking veggie packed sandwich. I think shredding the veggies is genius. I love grilled cheese sandwiches and can you believe April is grilled cheese month. I need to get out and get cheesing it. Also, I can't wait for my CSA to start either; the weekly farmer's market is the only thing getting me by. If I'm not mistaken, it was your comment in the fall that inspired me to write up this post. I hit the farmer's market last weekend and stocked up on honey and maple syrup . . . and giant bunny-shaped painstakingly decorated Easter cookies. They were good! We supported a local business! That's my story and I'm sticking to it. The beauty of the CSA is that there are no cookies to tempt me at the pickup site. And it all comes full circle; now that's a beautiful thing. I sent the Hubby out for bread yesterday and I told him to get not one, but two loves of something good because it's grilled cheese month here, and we are going to get our sandwich on. 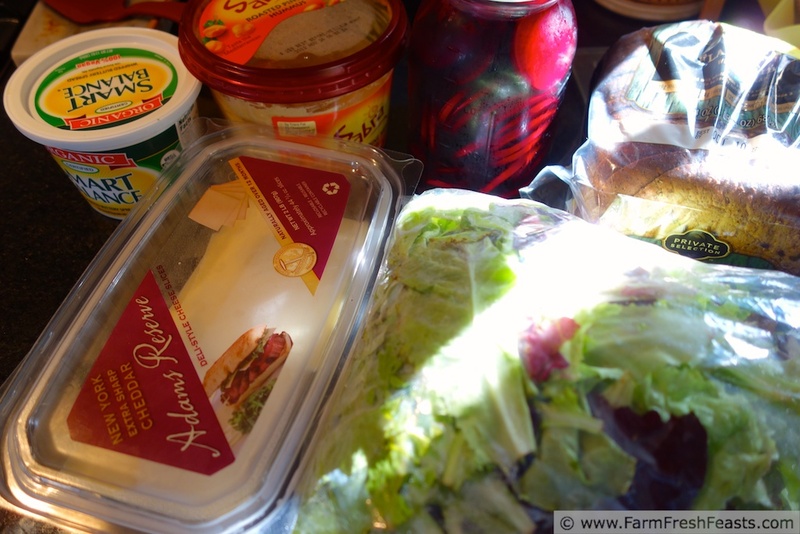 I went to the farmers market yesterday and they had no produce left, just some leeks and I've already got a bundle of those from the week prior, so I was forced to buy cheese from the grass fed cheese guy and that sort of falls in line with my soon to be sandwich making. Sometimes the universe, the cosmos, or just the blogs come together and propel you somewhere. For me, it's towards a grilled cheese and who am I to deny all those external factors? That's my story and I'm sticking to it. You eat those cookies and love them. Oh my goodness, this sandwich sounds SO delicious. You're making me hungry for sure! Well, your PB and jelly bars made me hungry, so we're even. Though I don't know what an accomplishment it is to make a pregnant woman, outside of the first trimester especially, hungry. So many things to pickle, so few jars . . . If you find a real pickled turnip recipe, please let me know. I love pickled anything! Especially on grilled cheese. Have you ever done it with kimchee? YUM! If you mean putting kimchee on a grilled cheese sandwich, that sounds pretty tasty to me. I was so spoiled living in Northern VA with so many great Asian grocery stores with buckets of fresh kimchee set out like barrels of pickles used to be when I was a wee youth. Here, though, if there is fresh kimchee I sure haven't sourced it. Doesn't mean it doesn't exist, just means I need to explore my new home a bit more. Nice twist on the grilled cheese sandwich, very thoughtful and creative! Thanks for the post. Dude. This is amazing. Hummus on a grilled cheese loaded with fresh veggies??? i think i'm in love. with you. or at least the sandwich. 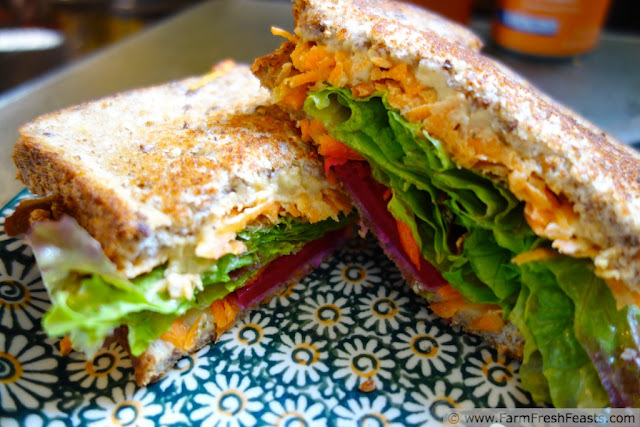 It's a tasty sandwich, please feel free to love it and make it your own with your twist on CSA veggies. This sandwich sounds very good.........Thank you for sharing with the Clever Chicks Blog Hop this week; I hope you’ll join us again! Looks yummy! My fav: roasted red pepper with pesto, havarti cheese, portabella mushrooms and heirloom tomatoes =) Oh, on homemade rosemary olive oil bread! That sandwich sounds delicious, right down to the last crumb! I'll ned to try that when tomatoes start appearing in the garden and farm share (though I love my plain tomato sandwich, too . . . decisions decisions). Thanks for sharing and linking up! Did you say that in a Crocodile Dundee voice? Because that's how I heard it. Yes, between Ben Stiller, Ellen Degeneres, and now Crocodile Dundee I've got a lot of voices in my head this morning. Thank you so much! It's such a great way to enjoy my CSA farm share veggies I hope other people get to enjoy their local veggies this way too. Ich esse total gerne Sandwiches, weil man sie immer wieder anders zusammen stellen kann und es im Grunde nie langweilig wird und zudem sind sie einfach immer sehr lecker. I'm playing with open-faced sandwiches now, and I have photos on my FB page. Ich bin mit belegten Brötchen Spielen Sie jetzt, und ich habe Fotos auf meiner FB-Seite. Pickled turnips....Okay, I can only imagine how much more delicious that would be! We have a chicken shop here which come with pickled turnips and my friends always give them to me...I then blow up like a puffer fish. It is awesome! So you want the puffer fish look? Good on ya, mate!